The Buck-184 Buckmaster - The peak of survival knives! The Buck 184 "Buckmaster" is a large Bowie-bladed survival knife, allegedly developed at the request of the US Navy SEALs. 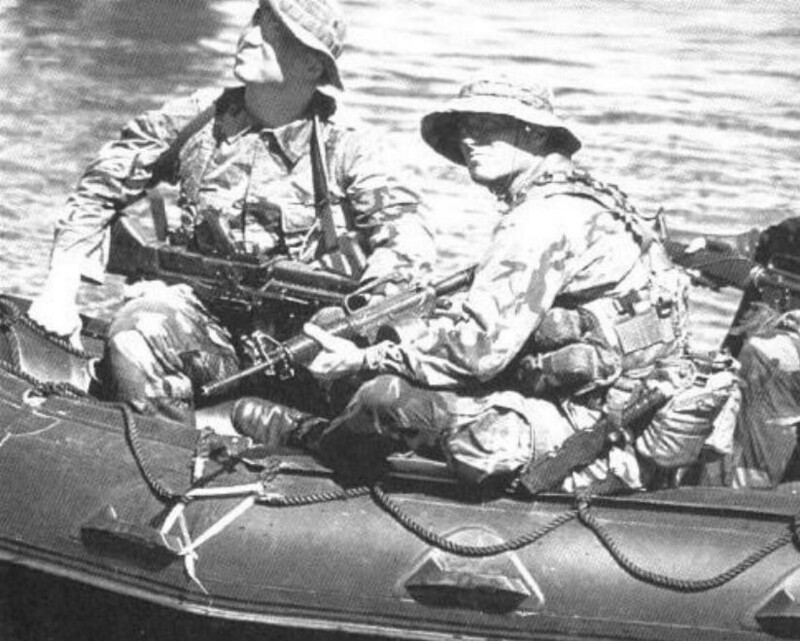 I received the following photo from a visitor to this webpage which shows a Navy SEAL with a Buckmaster strapped to his hip. The knife has a blade that is approximately 7.5" (19cm) long, and is of the classic Bowie shape. The hollow-ground main edge is about 6.5" (16.5cm) long. The false edge is serrated on one side. The back of the blade features a very aggressive 3" (7.5cm) long sawback. Maximum blade width is about 1.5" (3.7cm), and the blade is .288 - .290-inch thick. The blade is forged 425mod steel. The handguard is about 6mm thick, with both ends curving slightly towards the blade. Each end is drilled and tapped for a 2" (51mm) long, 10mm diameter "point" which is designed to allow the knife to be used as an anchor when a line is attached to the lanyard ring at the pommel. The grip is 4" (102mm) long and 1.25" (2.8cm) in diameter, knurled and grooved for a sure grip. The grip is hollow, with a usable internal opening secured by the threaded pommel, which in turn is knurled, slightly larger in diameter than the grip, and sealed with a black rubber O-ring. The threaded pommel also secured a 4.5mm thick steel stamping which is pierced to provide a lanyard/rope hole. Regarding the grappling hooks, these are described it the patent which CAN BE SEEN HERE. In brief, the patent discusses the attachment of the grapples to the quillon with sufficient strength to support a load of 600 pounds and reference is made to a casting line. With this said, it is generally accepted that using the knife as a grappling hook, which implies the act of tying a rope to the pommel and throwing the knife, could be very hazardous! In fact, the last of the BUCKMASTER knives came with small flyers saying that using the knife as a grappling hook would void the warranty. A better use of these hooks are as anchor pins where knife can be wedged in some rocks or the crotch of a tree and used with a securing line off the lanyard loop attached to the hollow handle cap/pommel. The sheath is of black rigid fiberglass-reinforced plastic. Attached to the front of the sheath are two removable black nylon pouches; the smaller one contains a full-size Silva Type 12 compass with a red cord lanyard. The back of the sheath has an inlaid sharpening stone. 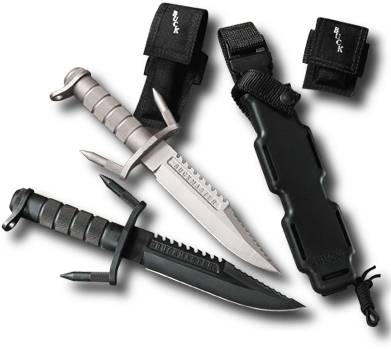 Heavy black nylon webbing is used to cover the stone, secure the two pouches to the sheath, secure the knife in its sheath, and provide a loop for a leg tie. An additional loop of black nylon webbing, with a Fastex-type closure, provides a quick-release belt loop. As for the knife's production, the Buckmaster was tested by and issued to the Navy SEALs for a short time. I have read that the knurled metal handle did a number on hands while chopping; it didn't do too well in salt water tests; and it was very heavy. Commercial production lasted 13 years but cheaper copies led to the end of the Buckmaster. These days the Buck 184 "Buckmaster" is extremely popular with collectors and I personally use one as a camp knife. 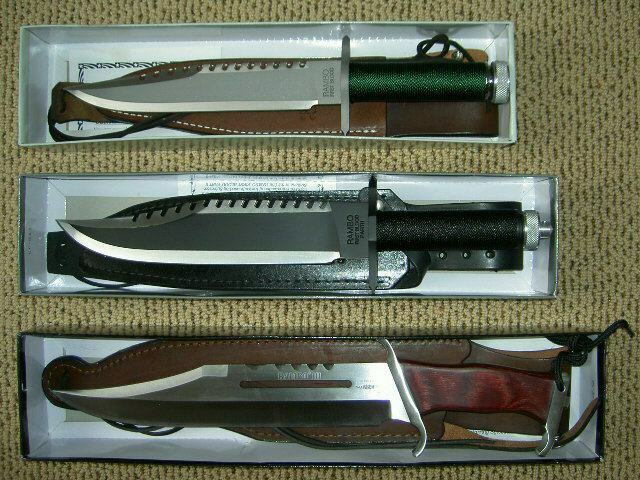 These knives are extremely rugged and the blade holds a sharp edge making them an excellent example of a Rambo era survival knife. There are four finishes that I have seen on these knives. The most common are matte stainless steel silver and a black oxide finished as shown in the picture above. I have also seen a few polished stainless steel blades. Beyond these I have seen highly polished blades, gold plated blades, and even a damascus blade Buckmaster that came from Buck's Custom Shop. Photos are at the end of this post! The Buckmaster was actually invented by Qual-A-Tec, a small R&D company formed in 1981. Fred Schumacher was a high-powered tax attorney who was looking for "acceptable" R&D developers. He met Charles A. (Mickey) Finn and talked him into starting the company. Mickey's intensions were to develop products in support of the U.S. Special Forces. (This was before USSOCOM was formed.) The shop started in one small bay in an industrial complex at 3204 Production Ave. in Oceanside, Ca. The R&D money flowed well for a couple of years then started to dry up as tax laws changed. Mickey was looking for other markets to develop products for and decided to go into the knife development business. At that time there were several people involved in the company. Wendy Finn (Mickey's wife) ran the front office. Bob McDonald ran the shop and he and his son produced the prototype knife components. Doug Olson remembers them milling the "hollow grind" in the blades with a rotary table on the mill (no CNC equipment). John Holm did all of the research and kept records for the office. Harry Camphuysen helped work on guns and since he also owned a pawn shop in Oceanside which was a dealer for Buck Knives, he had the ability to arrange for a meeting to show the prototypes knives to Chuck Buck Jr. Doug Olson worked out of a shop in Indiana and produced all of the drawings and helped in design of several components including the scabbard. The "Rambo" movies were just out and Mickey obtained three of the original knives to study.. The saw tooth look was "in" so it was used for the prototypes. Several blade shapes were looked at as well as handle designs and pommels. The design for the guard and the anchor pins came from Qual-A-Tec's association with the Seal Teams. The desire was for a way to use the knife underwater to anchor the swimmers gear to a pier or other underwater anchor point. The prototype was shown to Buck and Qual-A-Tec created a new company to deal with the license to Buck and to distribute the royalties. That company became Phrobis, Ltd. Buck was looking for a product to spark the dull knife market they were in and the Buckmaster really brought them publicity. They tried to hide the origin of the knife which is one reason the history of the development was kept quiet. Qual-A-Tec also wanted no publicity so the two company's goals worked together. Buck started production of this knife in late 1984 making 2600 that year. When Buck started production, the width of the blade was a real problem. This was before water jets and laser cutters became available so the production options were limited. Their first attempt was a die set that would blank the part from sheet stock. It lasted for only a few hundred blades then they had to abandon that idea. They had some machined out of sheet but they finally went to a forged blade. Knives from this era are stamped BUCK, 184, U.S.A. and will have a sand blasted finish. This finish differs from later versions with a shiny glass bead finish. In addition, there is a tiny dime sized compass which will be located in the pommel which was the case until approximately mid 1985. The sheath will be marked BUCK. In 1985 it occurred to Qual-A-Tec that they should protect this knife with a patent. The stamp was changed in late 1985, to BUCK, 184, U.S.A., PAT. PEND. A new larger compass, made by Silva, was added and the tiny one was dropped. This new compass fit in the small accessory pouch on the front of the sheath. PAT. PEND. was also added to the sheath mark. In 1985 Buck made 53,000 of these knives, while the following year knockoffs became to appear and sales plummeted. In 1986 the knives were stamped BUCK, 184<, U.S.A., PAT. PEND. This is also the time that Buck switched to forged blanks instead of conventional blanks. The only way to distinguish a forged blank from a conventional is to look at the end of the tang, which is not possible on an assembled knife. In mid 1986, records show a change to adding the rope cutting serrations after bead blasting. They would have a ground finish whereas the rest of the knife, excluding the edge, would have a bead blasted finish. The 184BK was added in September 1986. This knife was identical in all aspects to the previous version except for a black oxide finish. Effective November 1986, all Buckmasters were identified with U.S. Pat. #4622707. This identification was done by means of an adhesive sticker placed on the box. In Early 1987, this same designation was forged into the relief groove in the blade. Buckmasters from this point on did not have a date code. By the time they were discontinued in 1997, Buck had made 110,000 of these Knives in the various configurations. Mickey, of Qual-A-Tec also built some prototype knives without the hollow handle. The solid handle knife had a series of holes in it and bumps to separate the fingers. Once Buck started forging the blades, this was an obvious addition to the product line. They built another forging die and the result was the Buckmaster Lite as shown above. During the period that the Buck-184 and Buck-185 Buckmaster knives were made, the Qual-A-Tec folks found out about the Request for Proposal for a new Bayonet for the US Military. They took the Buckmaster as a starting point and redesigned the blade, scabbard and changed the handle to plastic and added a steel backbone through it. They originally took M7 bayonet latch assemblies and modified them to work with the new handle. You could see the rectangular hole was drilled out to a round hole that fit over the steel backbone. They went through several iterations of wire cutter and ended up with the one on the end of the scabbard. The first cutter plates were machined from thick plate to leave the bosses on the end. When Buck went to production they had the cutter plate fine blanked which allowed them to displace the button only part way through the plate. This worked so well that if you section one after heat treatment you can not even tell that the button was not built that way. The cutter turned out to be very reliable. The file/saw surface was another matter. The bayonet could not have the broad open teeth of the Buckmaster. Since the sides of the blade are parallel and flat, when you cut through something the width of the cut is the same size as the blade leading to binding. When the first blades were made the saw teeth were milled in and a burr was formed at the point where the cutter left the part. If this burr is left on the saw works well as it essentially makes the saw wider than the blade. Buck built the first few thousand blades that way then eventually changed to a broached cut which left no burr. No burr meant that the cutting went much slower and the required energy went way up. The scabbard also changed to provide a way to quickly remove the scabbard and knife from the uniform to allow the wire cutter to be used. Again, we looked at several scabbard designs including one from John Bianchi. We ended up using the Bianchi belt clip but went with our own scabbard design. The new company formed around the M9 Bayonet was Phrobis III, Ltd. We were the successful bidder and went on with Buck to deliver 315,600 bayonets on that first order. It was a very busy first year, getting the entire production going and delivering to the Government a full technical data package. After about a year of production, we went back to the drawing board to develop an improved scabbard. It had a molded belt clip that swung and a rubber molded secondary catch. (I have one of these prototypes and one of the engraved knives from Buck on the plaque held by an M4 barrel. (I will send photos later.) We also developed a smaller version of the knife and tried to market it as a Seal weapon. Phrobis III folded just a these were produced and they all went to Dan Olson (no relation), an ex-Seal who also worked for Phrobis III. 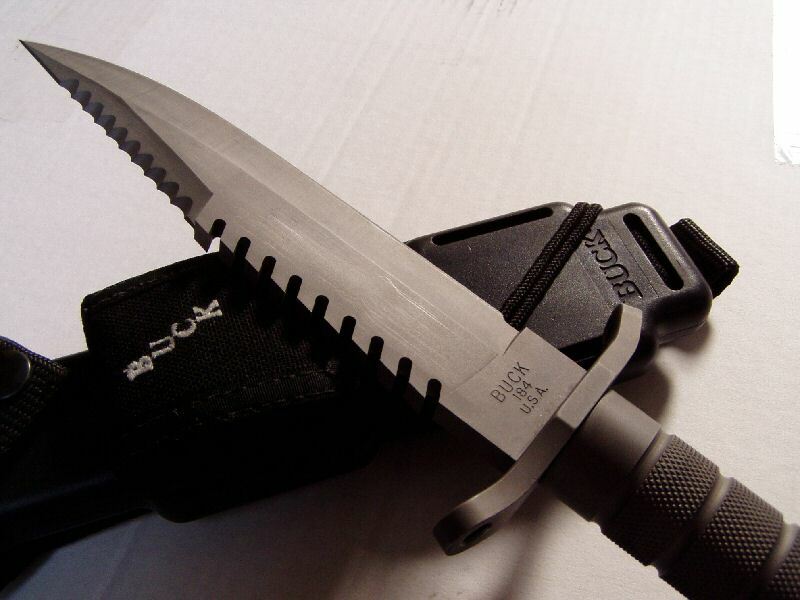 You can find additional information on the M9 Bayonet at M9Bayonet.com! Credits: Much of the information above was prepared and provided by Doug Olson a former employee of Qual-A-Tec and Doug Houser of the Buck Collectors Club. Additional informantion and photos came fron Bill Porter and many other sources that I can not specifically list.